Lake house destroyed. 38 dead. Cause unknown. Federal Agent Roland Banks has always done things by the book. It was the only way to avoid being dragged into the mire of corruption and quid pro quo that is government in Prohibition America. But when Banks busts the wrong bootlegging operation in backwoods Virginia, his punishment is a bizarre assignment in Arkham, Massachusetts. It is clear from the outset that Arkham keeps its secrets close, and Roland isn’t going to break open this case if he sticks to standard procedure. As the mystery and chaos surrounding the investigation threaten to unravel Roland, he must decide how much he’s willing to risk in order to uncover the truth. 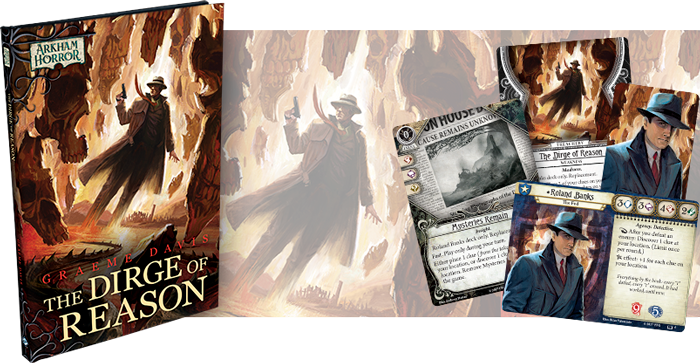 Fantasy Flight Games is pleased to announce that The Dirge of Reason, the thrilling new Arkham Horror novella by Graeme Davis (including four exclusive cards for Arkham Horror: The Card Game) is on sale now at your local retailer or on our website here! 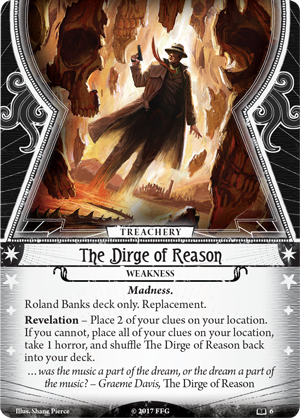 The Dirge of Reason throws you headfirst into the roaring twenties, where tragedy has struck the small town of Arkham, Massachusetts. During an apparent freak accident, the entire New England Virtuosi Orchestra perished, and federal agent Roland Banks has been sent all the way from Washington D.C. to investigate. The official report reads, “Explosion, cause unknown.” Can you really expect anyone to be pleased with a conclusion like that? The house looks like a howitzer shell hit it, but nobody knows why and the local authorities weren’t encouraged to look very hard. There is no gas that anyone knows of, and the boiler was far too small to explode with that amount of force. Could it have been bootleggers? A mob hit? Or something more sinister, something unnatural? Upon investigating the house, or what remains of it, Roland finds that even the trees are bowed away from the house as if some giant had pushed them askew. At the center of the clearing, there's nothing more than hints of foundation and a crumbling chimney which looms over a jumble of wood and rubble. There is no hint of fire anywhere. All the animals have fled, and the only sound is an unsettling wind that chills Roland’s heart and fills the federal agent with a sense of dread. Even dynamite would have been kinder than whatever happened here. With few leads and even fewer witnesses, Roland begins his investigation. But where it takes him may be worse than the crushing ignorance that haunts his waking hours. Now, you are invited to accompany the Fed and experience the mystery for yourself. 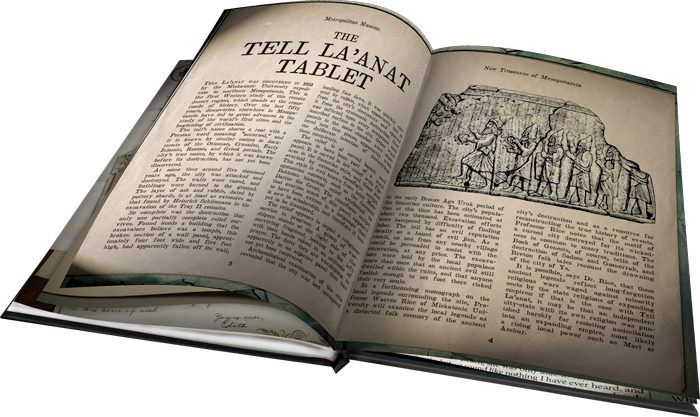 Within the pages of The Dirge of Reason, you will find full-color inserts of Roland Banks’s case notes as well as all the evidence that the agent has at his disposal: letters, newspaper clippings, and official reports. You have the unique opportunity to step into the federal agent’s shoes as you review the evidence that may lead to a crack in the case. The key to solving this riddle may be hidden right in front of you. 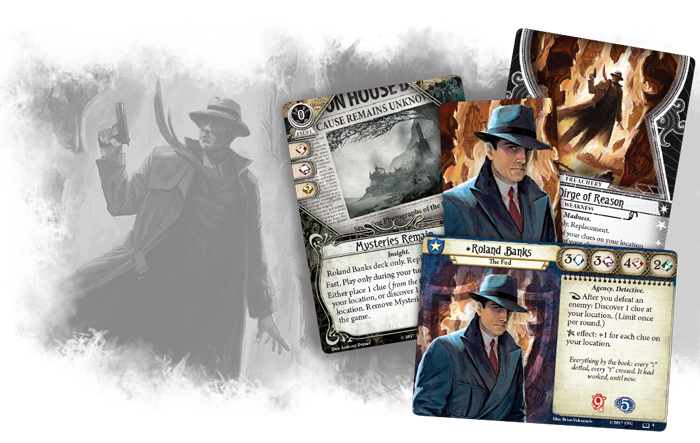 In addition to the novella, filled with the twists and turns that define the Arkham Horror Files universe, The Dirge of Reason includes four exclusive cards for Arkham Horror: The Card Game that can only be found in The Dirge of Reason. These new cards offer additional deckbuilding options for use with this investigator. The fearless Roland Banks was one of the first to confront the terrors that haunt Arkham when he entered Arkham Horror: The Card Game in the Core Set. Now, in The Dirge of Reason, the Fed gets a bold new player card to accompany his continuing adventures. Roland Banks is nothing if not a savvy investigator. Even in places where others are certain all clues have been found, Roland knows that Mysteries Remain (The Dirge of Reason, 5). When you are embodying the federal agent in your investigations, his natural Insight enables you to either place one clue from the token bank on your location, or discover one clue at your location, and then remove Mysteries Remain from the game. If you find yourself trapped in an investigation where you are constantly hitting dead ends, you may use this event to increase the number of clues at a location with a low shroud value, thus giving you the opportunity to gain more clues and advance the Act deck without struggling at locations that are difficult to investigate. However, on the opposite end of the spectrum, Roland Banks may become bogged down by The Dirge of Reason (The Dirge of Reason, 6) trapping him in his own form of Madness. 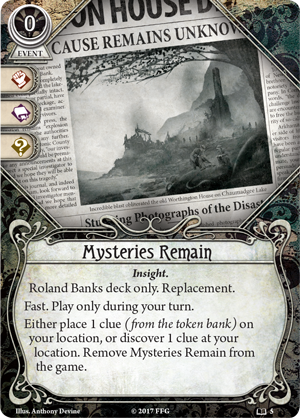 When you are playing as Roland and this card is revealed, you must place two of your clues on your location. If you cannot, you must place all of your clues on your location, take one horror, and shuffle The Dirge of Reason back into your deck. Roland may be a skillful, trained agent, but how can an investigator accept answers that defy all laws of logic? Solving this mystery will not bring back the lives that have been lost, but it may offer closure to the families and prevent anyone else from suffering the same fate. Expand your investigations, help Roland Banks crack the case, and never surrender to The Dirge of Reason! Pick up The Dirge of Reason (NAH11) at your local retailer today or on the Fantasy Flight Games website here!